This week’s Addicted to Fitness starts of with a recap of a recent trip back to my old kickboxing gym, Amir’s Academy. As soon as I walked through the doors at Amir’s, “Glory Days” by the Boss starting playing in my head. I owe a lot to Master Amir and his school and I knew he and his fighters would be the perfect people to help ETT client Carmin prepare for her upcoming celebrity boxing event. Master Amir put Carmin and I through 30 minutes of conditioning/cardio followed by several rounds of sparring. I was super proud of how Carmin performed in the ring. She sparred a very experienced martial artist for 3 rounds and did a fantastic job. After she finished, I knew that she was prepared for her match on November 12th at the Mike Calta Punchout 2. Shannon followed my week in training recap with her own (6 workouts in a row including an aerial yoga session) then we transition to a detailed examination of a natural sweetener called Swerve. Swerve is composed primarily of a sugar alcohol called erythritol. Erythritol is created when glucose ferments with the fungus Moniliella pollinis. According to the Swerve website, their product has zero calories, does not raise your blood sugar or create an insulin response. Preliminary experiments support their claims, but further studies are needed to determine if this is the zero negative impact sweetener we’ve all been waiting for. Even though it doesn’t create the same metabolic response as regular sugar, it’s taste may perpetuate the current sugar addiction we are currently seeing in this country. Shannon has used it in a few baked goods she’s made recently and I can attest that it taste just like sugar, which makes me believe that it’s zero health impacts are too good to be true. Our Swerve debate was not the only somewhat controversial topic we discussed on this week’s episode. Netflix recently added one of my favorite shows to their ever increasing repertoire of programming. Meateater can be described as a hunting show, but it is more a show about exploration and discovering what you’ll go through to obtain sustenance. Growing up on a farm, obtaining my own food, whether it be through hunting, fishing or farming, was an integral part of everyday life. Don’t get me wrong, we still went to the grocery store, but wild game was a staple of our diet. That’s why I wanted to have the conversation about wild game and how it’s obtained with Shannon. I’ve learned through the numerous years we’ve been together that Shannon is not a fan of the smell or taste of wild game (not including wild caught seafood). I describe the nutritional benefits of wild game, hunters contribution to wildlife conservation and the effect hunting has on your mindset. I know the topic of hunting can invoke a wide arrange of feelings in people, and I encourage you to leave your thoughts for or against it in the comment section below. If you have a comment about hunting, or any topic we bring up on the podcast, feel free to leave them below or reach out to us at elementaltampa@gmail.com. We love using your feedback to help make the podcast better. We’d also love it if you’d give us a rating and review on iTunes. We truly appreciate all the support you all give us. It really motivates us to put out the best podcast we can on a weekly basis. Keep listening, keep sharing and stay healthy this week peeps! We reach way back in the ETT Wrap Show vault for this episode. This week’s Addicted to Fitness podcast features my former cohost Tyler and a taste test of a protein bar made from a tasty little critter. Before we get into the taste test, Tyler and I discuss my experience learning jiujitsu from current UFC fighter Joe Lauzon. This eventually leads to us talking about two of the biggest names in MMA at the time, and now strangely enough, Conor McGregor and Jon Jones. I inform Tyler about Jones’ impending suspension and why I think there is “no way” McGregor could beat Nate Diaz in a rematch. Boy was I wrong. After all the UFC talk, Tyler and I jump into the protein bar taste test. Exo protein bars, according to their website, are “soy, dairy, grain and gluten-free. Paleo and environmentally friendly protein bars.” Most protein bars cannot makes these claims due to their ingredients, but the main ingredient in Exo bars is unlike any other protein bar. These bars are made with cricket flour. Yep, you read that right, this is a cricket bar. Most of the world already uses insects as a go to food source, but we still consider them somewhat taboo here in the United States. Except for crabs & lobsters which are essentially sea insects. Anyways, crickets produce 100x less greenhouse gases than cows and require a tremendous amount less water to produce than other protein sources like pigs and chickens (source). Tyler and I munch on two of these bad boys and to our surprise, love how they taste. High in fat and protein, these bars will keep you satiated a lot longer than any granola/trail mix bar. They also contain a significant portion of your recommended daily allowance of calcium and iron. The dates and honey used in the bars give them a relatively high sugar content, but I imagine the glycemic load is lowered due to the fiber and fat. I’d highly recommend everyone head over to the Exo protein bars website and grab a sampler pack. You won’t be disappointed, I promise. Let us know about the newest “health” food craze that you’d like us to try on the podcast. I already have a couple in mind *cough* cockroach milk *cough* but we always love hearing your suggestions. In addition to leaving us suggestions on future taste tests, please help us out by leaving us a rating and review on iTunes. Our downloads continue to climb each week which means your ratings, reviews and shares are helping us grow our audience. Thanks for the support and stay healthy this week peeps! Being a Maryland native, I’m predisposed to like crab cakes. It’s in my blood. In my opinion, the blue crab should be the state animal. Do states even have state animals? Anyways, I love this delectable seafood dish and depending on the ingredients, a crab cake itself can be rather healthy. My grandmother would use a little bit of flour as her binding agent, but the prominent ingredient, and rightly so, was the crab. Three ounces of cooked blue crab contains 15g of protein and almost half of your recommended daily allowance of vitamin B-12. The naughtiness of this awesome dish usually arrives with the addition of a sauce or a bun if you have it as a sandwich. 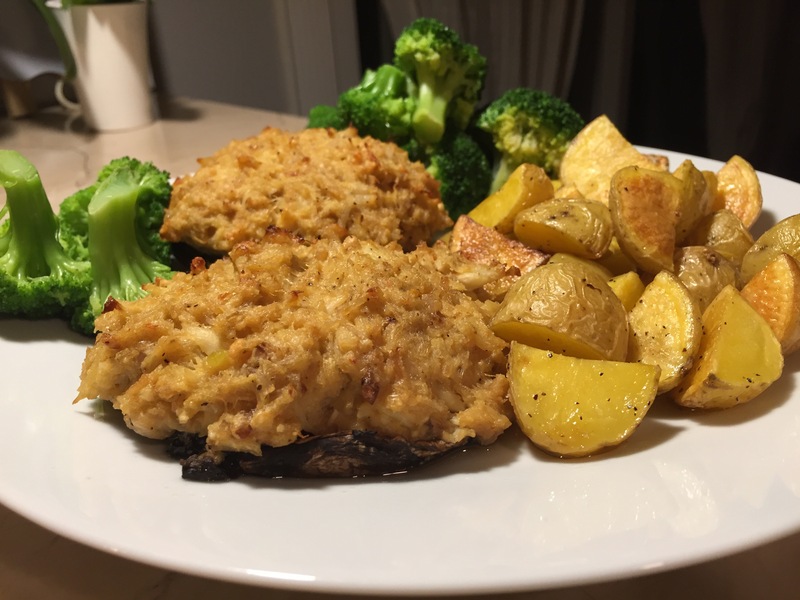 The version you see below, created by my talented wife Shannon, is the gluten free version of a crab cake “sandwich.” The crab is held together with egg, mayo and gluten free breadcrumbs and the “bun” is a portobello mushroom. I can tell you it would make my grandmother proud. If you’re sticking to a strict low carb diet you can ditch the potatoes for another vegetable. Trust me, you’re going to want to add this dish into your weekly meal plan. Fresh off our trip up to New England, Shannon and I kick off this week’s Addicted to Fitness podcast reminiscing about how good, and how bad we were in regards to what we ate. Shannon discovered, with the help of the Lose It! app, that the most egregious diet perpetrators were the adult beverages and dessert. In other words, SUGAR! Even though we strayed a little from our normal low-carb diet, we weren’t the only ones concerned about “cheating” on our diets. We discovered that a couple of close friends had recently joined Weight Watchers and I’m happy to say have had some awesome results. I know that in the past we’ve voiced our concerns about the long-term success rates of “calorie counting” diets, but I do believe they can make people more cognizant of the effect certain foods have on their bodies. Their weight loss and the way they were discussing food choices made me believe they were on the road to healthy eating. After our trip down recent memory lane, Shannon and I jump into a discussion about the 3 different body types. According to a article adapted from the book ROAR by Stacy T. Sims, PhD, the three general body types are ectomorph, mesomorph and endomorph. Each body type has different symmetry, ability to gain/lose fat or muscle, exercise preferences and nutrition requirements. According to the article, Shannon and I identify with a lot of the mesomorph qualities but we also possess attributes from the other categories. Check out this article and let us know which body types you most identify with. It may help you determine which nutrition and exercise plan will optimize your health. One of the seemingly antiquated methods to determine overall health is the Body Mass Index (BMI). A simple ratio of weight and height has been used for nearly 200 years to determine whether a person is underweight, normal weight, overweight or obese. Shannon and I discuss the pitfalls of BMI, including some troubling statistics brought to light in a recent New York Times article. The article breaks down a survey of over 5,000 people in which nearly 1 out of 5 participants were misidentified as being at a healthy or unhealthy weight. One segment of the population that is misdiagnosed are those with weight that is normal according to BMI, but their body fat % is higher than recommended. This phenomenon is known as “Skinny Fat” and Shannon and I describe why this may be more dangerous than being obese. Week in and week out, we try our very best to give you the most up to date health & fitness information. Whether it be about healthy foods, new exercise equipment or the latest wellness book, our goal is to provide information that will ultimately improve your quality of life. We already have our next interview with a health & fitness professional lined up, and we’re planning a couple cool on-location podcasts for the near future. Our weekly downloads continue to climb which tells us that you enjoy what you hear and you’re sharing the podcast. Keep on sharing and please, please, please give us a rating and review on iTunes. Thanks again and stay healthy this week peeps! 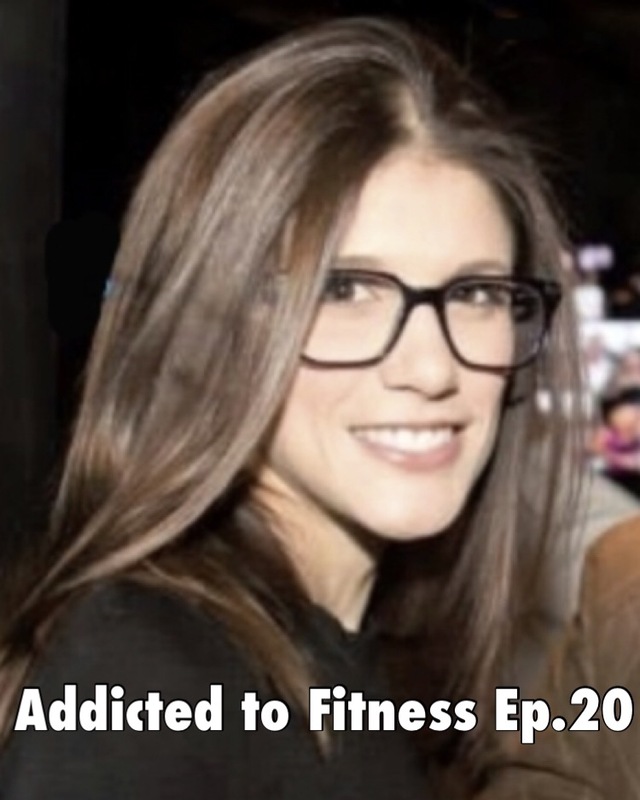 The highly anticipated interview with certified diabetes educator (CDE) Nicole Recine has finally made its way to the Addicted to Fitness podcast. In addition to being a CDE, Nicole is also a registered nurse and soon to be nurse practitioner. She has made numerous guest appearances on other podcasts including our friend Vinne Tortorich’s Fitness Confidential podcast. I hope you were looking forward to this as much as I was because Nicole doles out a ton of awesome health and nutrition information during this interview. Nicole and I discuss numerous topics including the difference between type 1 & type 2 diabetes, the insulin response created by certain foods and how a high fat-low carb diet may be the key to weight loss. If you’ve tried to lose weight and been unsuccessful, you may want to schedule a phone consultation with Nicole. Just head to her website for all the details on how you can enlist her services. The interview is definitely the focal point, but we also release the dates for a pair of upcoming ETT events on this episode. If you’re interested in finding out more about those events, just like us on Facebook. We’d also really appreciate if you’d give us a rating and review on iTunes. Your feedback helps us reach more people. Thanks for listening and stay healthy this week peeps! Today’s #whatiatewednesday post is a slight departure from what you normally see from me. I was doing some research for an interview that will be featured on an upcoming episode of the Addicted to Fitness podcast and I came across this chart from 2015 Dietary Guidelines for Americans. Every five years, the Office of Disease Prevention and Health Promotion (ODPHP) puts out a comprehensive report about what Americans are eating, how it’s affecting our health and somewhat educated suggestions on how to reverse some scary health trends. I believe that one of the reasons we’re seeing ever increasing rates of obesity and type 2 diabetes is due to the massive amount of grains, specifically refined grains, we eat on a daily basis. If you look at the chart below, you’ll see that some age groups are eating more than 1.5 times the daily recommended amount of refined grains. If you need a frame of reference for what 1 ounce of grain looks like, it’s equivalent to approximately 1 piece of bread. But bread isn’t the only culprit. Cereal, bagels, tortillas, grain-based dessert and numerous other refined grain products are contributing to several of the current health problems we as Americans face nowadays. Please don’t take my word for it. Do yourself a favor and check out research done by much smarter people than me like Nina Tecicholz, Dr. Mark Hyman and Dr. David Perlmutter (his book Grain Brain is enlightening). You can also listen to registered nurse and certified diabetes educator Nicole Recine on the upcoming episode of the Addicted to Fitness podcast. She, along with the other people I listed, do a great job explaining the detrimental effects of excess carb intake. Shannon and I start off this week’s episode reminiscing about our past week of training. Our workout recap got me thinking about a possible exercise experiment. We’ve talked about which exercises burn the most calories according to a Harvard medical school publication in a past episode, but I want to determine which of the following exercises burn the most calories in 10 minutes: jump rope, shadowbox or stationary bike. Not sure if I’d be able to podcast this experiment, but I’d certainly post the results in a future blog. Which of those exercise do you think would burn the most calories in 10 minutes? After our training recap, Shannon and I investigate the actual definitions for several commonly used food label terms. Thanks to an article written by Sheah Rarback, a registered dietician and nutritionist at the University of Miami Miller School of Medicine, we discover what the terms natural, GMO, non-GMO, gluten-free and organic really mean. Make sure you listen to this episode because I think you’ll be surprised about what products are allowed to use these terms. I know I was. In addition to these terms, we also discuss the ever evolving concept of “grass-fed.” Shannon and I frequently purchase grass-fed products, but after reading an article about the USDA recently dropping their requirements for a product to be considered grass-fed, we’re definitely rethinking adding them to our weekly grocery list. We are constantly trying to provide you with the most up to date health and fitness information. That is why I am please to announce that next week’s episode will feature an interview with registered nurse and certified diabetes educator Nicole Recine. Nicole is full of information on a variety of health and fitness topics including how we can fight the current obesity epidemic. If you have a suggestion for a health and fitness professional we should interview on the podcast, please leave it in the comment section below. After you leave your suggestion, please give us a review on iTunes and when you share this episode, tell your friend to do the same. Thanks in advance and stay healthy this week peeps!